Sohaib Maqsood played a mach winning knock (89 not out), the best score by the ODI specialist. Pix: Kamal Jayamanne. Hambantota, Aug. 23 - After a really stunning game of cricket, Pakistan pulled off a thrilling four-wicket win over Sri Lanka with a ball to spare in the rain shortened 45-over first One Day International match at the Mahinda Rajapaksa Stadium, Hambantota today. The Sri Lanka Rugby Sevens team came up with a superb display to register two good victories over China and Chinese Taipei on the first day of the first-leg of the Asian Rugby Sevens series at the Happy Valley football grounds in Hong Kong yesterday. In their first game the Lankans beat China by 17 points (one goal, two tries) to 5 (one try). 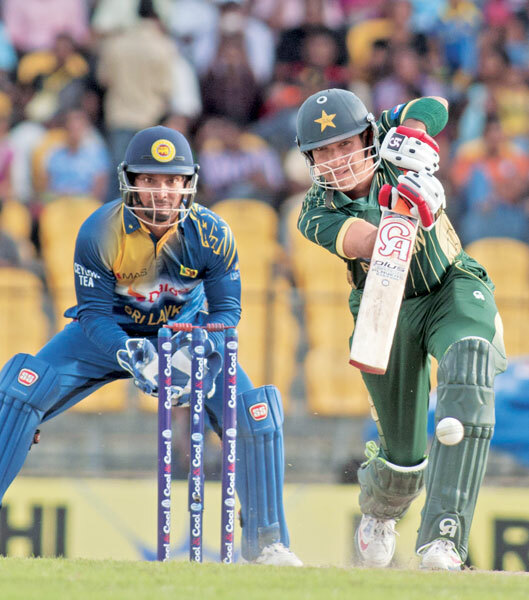 The second One Day International between Sri Lanka and Pakistan, which was scheduled to be played at the R Premadasa Stadium, Colombo on August 27 (Wednesday), has been shifted to the Mahinda Rajapaksa Stadium, Hambantota, Sri Lanka Cricket announced yesterday.